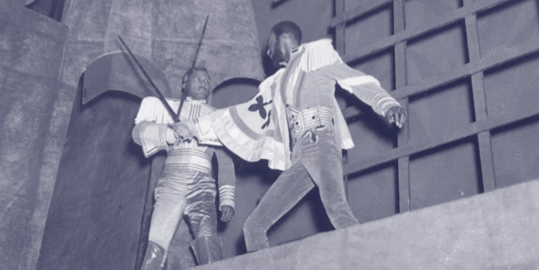 Photographic print from Federal Theatre Project production of Macbeth, New Lafayette Theatre, NewYork City, April 14–June 20,1936. Courtesy of the Library of Congress. In the middle of the Great Depression, the U.S. government’s New Deal program inaugurated the Works Progress Administration (WPA) to provide relief work for unemployed Americans, including artists. The Federal Theatre Project (FTP) was one of these programs. Although it lasted only four years, scholars have acknowledged its prevailing influence on 20th- and 21st-century theatre. University of Massachusetts Amherst Graduate Student Amy Brady is the recipient of the 2012 CRL Primary Source Award for Research for her CLIR/Mellon-funded project that examined primary sources in the Library of Congress archives that relate to plays produced by the Federal Theatre Project. She used these sources to determine where and how the work of radical avant-garde FTP artists caused political and ideological contradictions in their productions, such as the expression of radical propaganda versus more moderately toned New Deal rhetoric. Thanks to a CLIR/Mellon fellowship, she worked in conjunction with the Library of Congress’s Preservation Research and Testing Division (PRTD)—especially Fenella France, the Library’s Chief of the PRTD, and technician Meghan Hill—to create hyperspectral digital images of Federal Theatre primary sources. The technology made visible typed-over text and handwritten revisions that had faded with time. These images allowed Brady to make new interpretations of Federal Theatre history that account for the avant-garde’s influence. The images will also open new avenues of research for other scholars as she and the Library staff make them available for future study. This full spectrum color image from Act 3, page 6, of a little-known Federal Theatre play called Return to Death. Courtesy of the Preservation Research and Testing Division, Library of Congress. For this project, Brady pieced together several different types of primary sources, including scripts and playbills, set designs, and correspondences between theatre personnel, to reconstruct the historical circumstances of several never-before examined FTP productions. She then utilized the PRTD’s hyperspectral imaging unit on scripts used by actors and directors involved with these particular productions. The hyperspectral unit employs eight different light wavelengths to make visible text and handwritten markings that have either faded or been intentionally erased and thus have been until now illegible to the naked eye. This research marks the first time in the Library’s history that the hyperspectral imaging unit has been used on FTP documents, and Brady’s interpretation of this new data contributes to a more comprehensive historical picture of selected FTP productions. 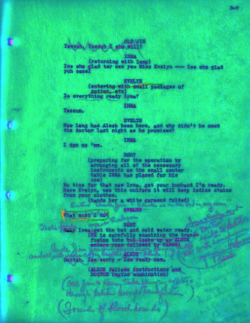 In particular, the imaging has made it possible to read the scripts’ original wording as written by avant-garde artists, as well as the artists’ handwritten revisions that were thought to have been lost forever. The recovery of the plays’ original text and handwritten revisions has made it possible to determine where and how the productions changed over the course of rehearsals and rewrites. When contextualized with other primary sources at the Library, these revisions revealed new insights into where and how the avant-garde artists exerted influence on FTP productions, and moreover, how this influence resulted in the continuation of radical, avant-garde projects on government-funded stages. Brady’s research with Federal Theatre primary sources contributes to new knowledge in at least two ways: it broadens scholars’ understanding of the avant-garde artists’ history while contributing to a more comprehensive conception of the American Federal Theatre Project. Moreover, cataloging the hyperspectral images and making them available for future study opens up new avenues of scholarly research.